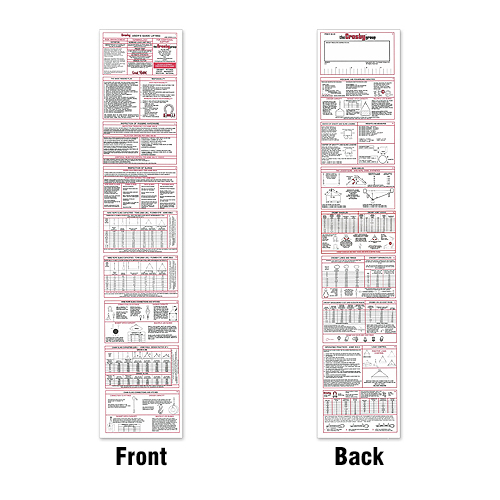 This is probably the most widely-used and most sought after rigging field guide available. 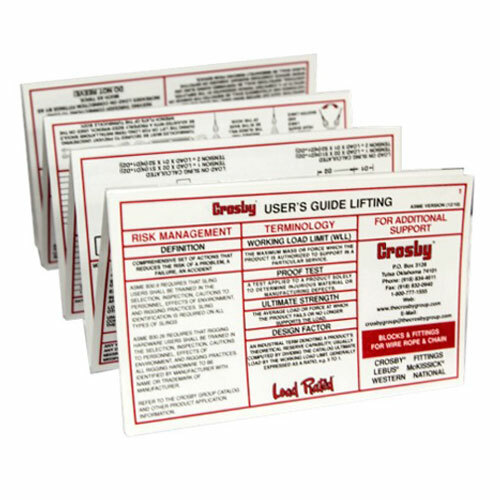 Our customers order these cards year after year, because they know that their guys in the field can work more safely and efficiently if they refer to this guide when rigging. This handy guide covers the following: Basic Rigging Plan, Inspection of Slings and Hardware, Sling Capacities (chain and wire rope), Lifting Angles, Assorted Hardware Ratings (links, shackles, etc.) and Wire Rope Clips. This is not an exhaustive list, but these are some of the key components on this card. You really can't get a more compact, useful and well thought out rigging guide than this one! Does this card have all the hand signals? No, this card does not include hand signals. Is the rigging card up to date? Crosby had the following answer: "The answer is Yes, with this exception. Where referenced, the “Horizontal Sling Angle” is now known as “Angle of Loading”. Other than that, it is good to go."